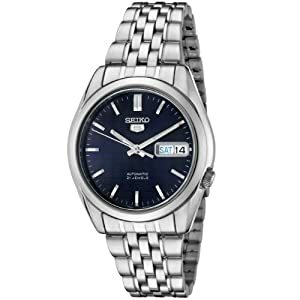 This watch has a stainless steel case and band that use a combination of brushed and polished metal. The dark blue face and silver-toned hands and hour markers contrast well. Hands and hour markers are luminous for visibility in the dark. The calendar displays the day and date, and can be found in the 3 position. Water resistance is only 30 meters (99 feet), so don't put it under water. The crown is in the 4 position for extra comfort. This is a nice watch and perfect for daily use. It uses an automatic movement that gets wound by normal arm movement, but it doesn't have much reserve power. It's best to wear this watch every day or it will stop running after about 36 hours. Nice watch - especially the price.